Go Mi Nyu(高美女） is a sister-in-training. When her fraternal twin brother Go Mi Nam（高美男） was reported to be in the United States having surgery to fix his previous plastic surgery effort, she was approached by the Manager of the singing band A.N.JELL to pose as Mi Nam for the time being that he is away. Mi Nam had just recently been accepted by the President of A.N.JELL to join the group. Against her wish, Mi Nyu accepts after remembering why her brother wanted to be a singer in the first place (to find their mom). Now posing as Mi Nam, Mi Nyu enters the group A.N.JELL and meets the members: Hwang Tae Kyung, Kang Shin Woo, and Jeremy. Initially disliked by Tae Kyung, the group's leader and composer, Mi Nyu later falls in love with him and finds herself being entangled in a love triangle between him and Shin Woo, while Jeremy harbors a one-sided love for her. 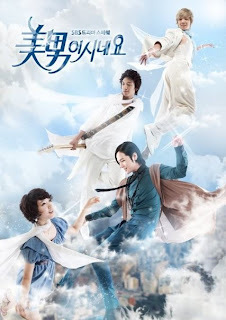 The cast of "You're Beautiful"